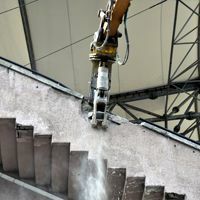 With protests ongoing nearby, chairman of Beşiktaş still decided to go ahead with yesterday’s ceremony, during which he crushed the very first piece of concrete at Inönü Stadi’s north end. Opening of the new stadium is expected already next year. Back on Saturday the street running just meters west of the stadium was the frontline of some clashes between protesters and the police in Turkey’s ongoing civil rights crisis. With Sunday being relatively calmer Beşiktaş JK decided to go ahead with their groundbreaking ceremony. Breaking literally – the football ground’s first piece of concrete was crunched by chairman Fikret Orman, with other club officials present. Though it was only symbolic and didn’t mean bulldozers storming the cult stadium, almost all of the structure should be gone by July. Things that will be kept within the new arena are the southern towers and amphitheatre. Along with the plan and yesterday’s declarations, within the next year fans will see almost all of the new stadium built, while opening is scheduled for October 2014. The $95 million project has an extremely tight schedule, then, but one that may be abided. Until the new 41,000-seater is ready, BJK are to play at another stadium in Istanbul, most probably at the national Atatürk Olympiat Stadi. When they move back to their home, it will boast 144 skyboxes to help the club compete with largest local rivals and other strong clubs in Turkey that will be getting new stadia – to name just Trabzonspor or Bursaspor.